Handmade Howlite and Leather Pendant Necklace from Thailand, "Beautiful Avocado"
Beautiful and bohemian, this pendant necklace from Thailand is presented by Chaloemphon. 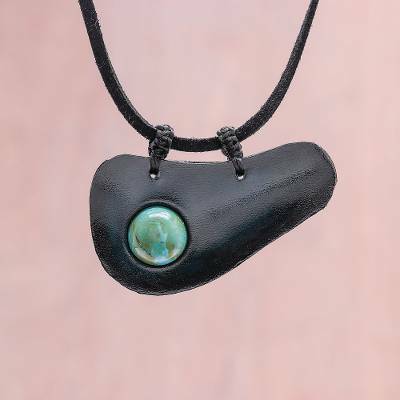 Local artisans work with leather, tooling it by hand into an avocado-shaped pendant in deep blue that hangs sideways. A single bead of sky blue howlite is the "seed" of the fruit. The pendant centers an adjustable length of leather cord, complete with a raintree wood sliding bead and bone accents at the ends. You can find howlite and leather pendant necklace 'Beautiful Avocado' by Chaloemphon in jewelry categories such as Bohemian Necklaces, Gemstone Necklaces, Howlite Necklaces, Leather Necklaces, Bead Necklaces and Pendant Necklaces. Enjoy exploring these sections for other Novica treasures.